After deciding to attend college, the next step is choosing the right school to meet your needs. Utah's colleges and universities feature a variety of degree and vocational programs across its 24 public, private and private religious institutions. 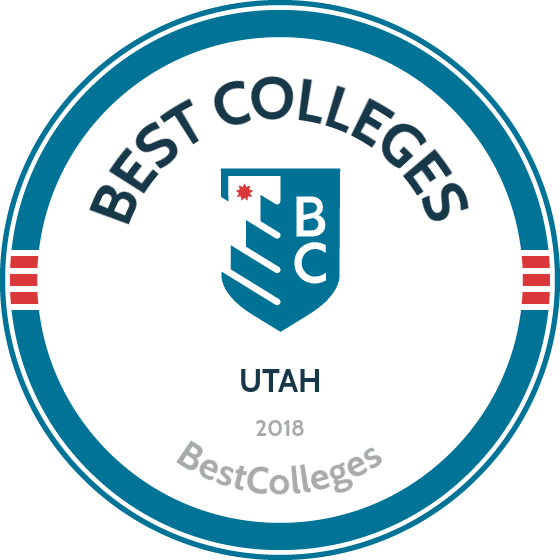 To assist you in this process, we have applied our rigorous methodology to the latest education data to rank the best colleges in Utah, including the top four-year and two-year schools. As one of the most educated states in the nation, it's no surprise Utah is home to four-year institutions with great educational outcomes. Thanks to a statewide education initiative in 2014, Utah universities have put emphasis on expanding programs in areas with high earning potential (such as health, science and engineering), offering students a good return for their investment. The initiative also includes a comprehensive retention strategy, called Finish in Four, which creates a framework of community-based resources to help students reach their educational goals. Although a bachelor's can seem cost prohibitive, the Utah System of Higher Education incentivizes students with plateau tuition, providing a discount to students who commit to enroll full-time. Below is a list of the top schools to help you get started. Brigham Young, located in Provo, 45 miles south of Salt Lake City, has 10 colleges, including a graduate school, law school, and school of management. BYU offers over 170 bachelor’s programs with an array of majors including wildlife and wildlands conservation, physics, philosophy, neuroscience, exercise science, Arabic language, nutritional science, and linguistics. Guided by The Church of Jesus Christ of Latter-day Saints, BYU’s mission is to support students who seek perfection and eternal life. BYU encourages students to integrate their faith with their education; undergraduate students must take one religion class each semester until they earn 14 semester hours. The student body represents over 100 countries, and more than 23,000 students participate each year in over 70 community service programs. Certain degree programs require applied learning experiences like internships, clinical work, or field studies, while other programs recommend it to enhance a student’s major. BYU’s academic environment, unique among colleges in Utah, extends beyond the classroom. BYU is home to a 100,000-square-foot museum of art, a science museum with three million biological specimens, and an archaeological and ethnographic museum with special expertise in prehistoric Utah and the American Southwest. Utah has 17 colleges and schools and almost 100 departments. The school offers over 80 undergraduate majors, including minors and certificates. Students can pursue bachelor’s degrees in atmospheric sciences, ballet, gender studies, kinesiology, peace and conflict studies, and more. University of Utah is known for its entrepreneurial pedigree. It’s one of the best colleges in Utah for start-up company creation. The Hinckley Institute engages students in governmental processes and prepares them for public services. The Lassonde Entrepreneur Institute provides students from any major with workshops, business plan competitions, start-up support, and more. The Center for Engineering Innovation serves industry and public/government collaborators, including faculty, staff, and students, by turning basic science into commercial products. Alumni includes the presidents of Pixar Studios, Zions First National Bank, Procter & Gamble, and Jet Blue Airways; U.S. senators, award-winning authors, professional athletes, and many more. WGU’s programs are designed for working adults who need a more flexible learning environment. The teacher’s college offers eight online bachelor’s degree licensure programs and 17 online masters programs. Other degrees include 12 online bachelor and master’s degree programs in business, 10 online bachelor and master’s programs in information technology, and 11 bachelor’s and master’s programs in nursing and related professions. Each degree program is developed by a council of experts in the field who identify the competencies students need to obtain for graduation. Competency-based learning eliminates spending time and money on content students already know. Those with prior relevant experience can accelerate their time to degree completion by completing competency assessments. The average WGU student is 37. Like other Utah colleges, online classes at WGU do not operate on fixed schedules. An assigned student mentor with subject matter experience in the student’s field helps develop a study plan, provides feedback, and ensures students maintain motivation through regularly scheduled, weekly conversations. Westminster offers a liberal arts education blended with professional programs. It offers 52 undergraduate and graduate programs at its Salt Lake City campus. There are 38 bachelor’s degrees in majors like public health, political science, and finance. Westminster’s 2,100 undergraduate students enjoy personalized attention from faculty with a 9:1 student-to-faculty ratio; 93% of full-time instructors hold the highest available degree in their fields, contributing to its status as one of the best colleges in Utah. The 32-acre campus includes a LEED-certified science center, library, athletic and recreational facilities, and art and performance spaces. Produce and eggs from Westminster’s organic garden and chicken coop, tended by students, is available to students at no charge. The school offers a variety of year-round fitness, wellness, and recreational programs that include rock climbing trips, hip-hop classes, and cross country ski trips. Varsity sports include alpine skiing, dance, snowboarding, and lacrosse. Utah Valley started as a vocational school during World War II. The school has eight colleges, a graduate school, and six satellite centers for nontraditional students. Utah Valley is the largest public educational institution among Utah colleges and recognized as one of the safest schools in the country. It has largest Latter Day Saints Institute program in the world; UVU is located a few miles from Brigham Young University. Utah Valley offers 146 bachelor’s degree programs including a diverse selection of majors in personal finance planning, mechatronics engineering technology, digital cinema, and botany. The school has eight master’s degree programs and a distance learning program, including certificates and associate degrees. UVU provides numerous academic, vocational, technical, and workforce training projects for students. The field station at Capitol Reef National Park supports engaged learning and research through fieldwork in the Colorado Plateau. Snow, located in the mountains of Sanpete County in central Utah, has campuses in Ephraim and Richfield, along with an online degree option. As a community college, Snow is committed to helping students get started on their journey, whether they’re transferring to a major university or launching their career immediately after graduation. The school offers more than 80 associate degrees and over 40 certificate programs in subjects like welding, farm and ranch management, and business and music technology. There are two bachelor’s programs: the first is music with an emphasis in commercial music, a degree that is unique among Utah colleges with its focus on the music industry and entrepreneurship. The second bachelor program is for software engineering, a new course starting this year that offers three areas of emphasis: entrepreneurship, digital media design, and web development. Most fields of study expect students to take certain prerequisite courses that prepare them for transfer; Snow offers nearly all of these courses. Utah State funnels over $200 million into collaborative faculty and student research initiatives each year with industry and military partners. USU’s Innovation Campus is a high-tech research park with facilities and programs that stimulate business growth and help students gain hands-on experience. The school’s Space Dynamics Laboratory works to solve technical problems faced by the Department of Defense and industrial concerns. Each year, over 1,000 students enroll in USU’s undergraduate research program to partner with faculty on research projects, reaffirming USU’s reputation as one of the best colleges in Utah for research. Utah operates three regional campuses in Brigham City, Tooele, and Uintah Basin. It’s has seven colleges, plus the Huntsman School of Business, which offers a range of undergraduate, graduate, doctoral, and specialized degree programs. This includes 159 bachelor’s degrees in majors such as aviation technology, fisheries and aquatic sciences, human movement sciences, journalism, and statistics. USU’s student body is over 28,000 students. USU alumni include 23 Goldwater and seven Rhodes Scholars, NASA astronaut Mary Louise Cleave, human rights activist Greg Carr, and 2013 Nobel Prize in Economics winner Lars Peter Hansen. Weber State maintains campuses in Ogden, Layton, Morgan, Roy, Clearfield, and Farmington to provide undergraduate degrees, graduate degrees, and certificates throughout the Northern Utah region. Weber is organized into seven academic colleges with over 50 academic departments offering more than 230 programs, online and on-campus. Undergraduate programs include business administration, criminal justice, early childhood education, and electrical engineering. The student body of over 24,000 students attend either WSU’s main campuses in Ogden or Layton, or the additional learning centers in Roy and Clearfield. Compared to other Utah colleges, WSU students are more likely to be first generation college students, work full-time, and receive financial aid. 56% of WSU students attend school part-time, and their average age is 26. The school believes protecting the environment is important and has pledged to become carbon-neutral by 2050. Weber has men’s and women’s athletic teams. Based in Cedar City, Southern Utah University is home to more than 9,200 students and ranks among the top public colleges in Utah. SUU offers more than 140 unique academic programs, such as aviation, outdoor recreation in parks and tourism, French, athletic training, and human nutrition. Undergraduates can also choose from a wide selection of innovative academic minors, such as museum studies, library media, physical education, and Shakespeare studies. SUU hosts the annual Utah Shakespeare Festival, which draws more than 100,000 visitors each season. The SUU campus also hosts a student radio station, cable television channel, and the Michael O. Leavitt Center for Politics and Public Service, which encourages public participation and good citizenship among students. The center works to develop community engagement through public policy awareness, voter registration drives, public service activities, and internships. Independence is an online university offering employment-focused degrees at the associate, bachelor’s, and master’s levels. IU is known for its fast track degree programs, personalized support, and monthly program starts. Independence merged with Stevens-Henager College in 2010 and is a branch of Stevens-Henager’s main campus in Ogden. There are additional campuses in Provo, Salt Lake City, Layton, St George, and Logan. IU has schools of healthcare, business, technology, and graphic arts. It offers six associate degrees, like the medical specialties program; 16 bachelor’s degrees, like the accounting with a forensic accounting emphasis program; and eight master’s programs, like the nursing administration program. The programs are fully online and career focused, with no elective courses. The schools of healthcare, technology, and business offer curriculums that reflect feedback from the schools’ business partners and advisory committee. Unique among colleges in Utah, all students receive a tablet on the first day of school and later, a new Mac® laptop loaded with software. A two-year degree can be a great option for students seeking a smaller campus experience and lower tuition; some also prefer the vocational options and specialized certificated offered by these types of colleges. A selection of Utah's two-year institutions are part of the Career and Technical Education Pathway, or CTE, which promotes programs benefitting those already in the workplace, as well as students seeking specific job and skill training. To further encourage attendance for all income levels, pilot programs such as the Partnership for Accessing College Education, offer complete scholarships for associate degree earners. We've compiled a list of the best schools below to assist you in the decision-making process. Snow College is one of several community colleges in Utah that offers an honors program and degree pathways to help students transfer to a four-year university easily. The university is known for high student satisfaction rates, with 93% of students saying they would recommend others to attend. High school juniors and seniors can experience Snow College with overnight visits available throughout the year at both the Richland and Ephraim campuses. Eight athletic programs, including rodeo and softball teams, make Snow College an exciting place to live and learn. Snow College's Horne Activity Center features facilities for racquetball, swimming, basketball, soccer, indoor track, and other athletics. Interested students can take an online virtual tour to view facilities available on campus. Additionally, the college offers benefits to veterans, including an early registration date and various VA programs. Snow College also caters to distance learners, offering hundreds of online classes that make it easy for anyone to learn from home. Located in Salt Lake City, LDSBC offers degrees and certificates in fields like business, health, technology, and interior design. The university is owned and operated by the Church of Jesus Christ of Latter-day Saints, and 99% of the student population is LDS. The school embraces several core themes, focusing on strengthening discipleship, teaching practical skills, and cultivating a nurturing environment. LDSBC boasts small class sizes, with an average student-to-faculty ratio of 12:1. LDSBC students come from all 50 states and 58 foreign countries. Scholarships and financial aid are available to help make programs more affordable. If you aren’t sure what you want to study, LDSBC offers an inexpensive, six-week, on-campus Discovery Experience to help students find their personal mission and create a specific, goal-oriented plan for their education. This is a unique program among Utah community colleges. If you're looking to advance your education while learning how to become a midwife, MCU in Salt Lake City is the best option among two-year colleges in Utah. The college features one of the largest and longest-standing direct-entry midwifery programs in the nation. Services available to those studying at MCU include clinical placement assistance, mentoring, peer groups, a writing lab, and house mothers who help students create and reach goals as they complete their education. MCU's academic calendar is on the trimester system. MCU offers associate, bachelor’s, and master’s programs in midwifery. The school's distance education program allows for the flexibility working professionals and other nontraditional students need to complete their degree. Personal coaching provided by academic advisers helps students plan and reach their personal, academic, and professional goals. MCU also offers sisters’ circles to build a community of caring support between students. The school's student council fosters an interactive understanding of school policies and regulations. SLCC is one of the best community colleges in Utah, thanks in part to having the most diverse student body in the state. Availability of online classes and flexible scheduling (with classes starting as early as 6:30 a.m. or as late as 8:30 p.m.) allow students to work while they earn their degree. Nearly 70% of SLCC's students are working professionals. The school offers 120 programs of study, including an advanced fashion institute program available on campus. SLCC is more affordable than any other college in Utah, and also provides a high-quality learning experience. The average class size at SLCC is 20 students. Students can easily transfer to a four-year institution, and 54% of SLCC students go on to learn at the nearby University of Utah. SLCC also supports students through its developmental education programs, which emphasize math and English skills. If you're thinking about applying to one of the best colleges in Utah, continuing reading to learn more about living in the Beehive State. This western, desertous state is perhaps most famous for it's Salt Lake City region and ubiquitous religious culture, but Utah has much more to offer than Temple Square. With a population of nearly 3 million spanning 84,899 square miles, the area contains a wealth of natural wonders, cultural centers and paleolithic history . With a climate ranging from temperate to arid, Utah boasts both snow-laden ski resorts and expansive deserts, so there is something for every outdoor enthusiast to enjoy. With a rapidly expanding economy, Forbes ranked Utah #1 on its list of Best Places to Start a Business. Contributing to the growth is a statewide emphasis on engineering and technology, as well as low energy costs (26% below the national average); the region also boasts a nationally-low unemployment rate. To provide a greater understanding of the state, we have highlighted Utah's five major regions below, each unique in topography and economy. To the north, the climate is mild and mostly dry, with myriad natural attractions and open country. Similarly, the western part of the state is largely unpopulated but is home to beautiful and expansive desert, as well as several tourist-worthy ghost towns. At the heart of the state is Salt Lake and surrounding area, which is home to capital Salt Lake City and is also the region's business hub. Moab desert, a popular rock-climbing destination, is found to the east; ski enthusiasts can find plenty of slopes in the mountain-filled southwest. Utah's diverse geography and thriving economy make the state a great choice for students. Establishing residency prior to enrollment is key to receiving the best price on tuition, and since the criteria for becoming a resident may vary from college to college, it is a good idea to start the process as soon as possible. Minor residency status is dependent upon parental status. In Utah, at least one parent must reside in the state, and the minor must live full-time with this parent. Proof of parental residency is required for all students who are considered minors. You must reside in the state for at least one consecutive year before enrollment. You must relinquish all other state residencies in the form of a written declaration. You must show proof that you have taken steps to establish permanent residency, such as a rental agreement or proof of employment.